If it won't fit in an Ebira Rod Quiver, you don't need it. One of the main attractions of tenkara is simplicity, and although simplicity and minimalism are not the same, tenkara fishing makes you realize how little you actually need to catch fish - a lot of fish. You know you have achieved the simplicity when everything you take fits in the quiver. 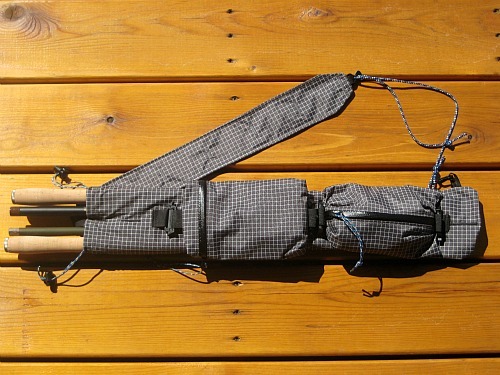 The Ebira rod quiver was designed by TrailLite Designs. The Ebira now comes in two lengths - the standard model sized to fit the most tenkara rods and the shorter Ebira K. Initially designed to fit the Daiwa Kiyose and Shimotsuke Kiyotaki rods, the Ebira K also fits the Suntech Genryuko and the Tenryu TF39TA. Please note: All the various Ebiras now come with black cords (rather than orange), as shown in the photo of the Ebira K below. The Ebira (Japanese for "quiver") is really quite similar to an archer's quiver. It has an adjustable cord so that you wear it over your shoulder. It holds your tenkara rod, leaving your hands free for trekking poles or for climbing or photography - or just free. In addition to the sleeve that holds your rod, the Ebira also has a small, detachable pouch that will hold flies, lines, tippet, nippers, forceps, etc. The pouch can be attached to either side of the sleeve, so no matter which shoulder you sling the Ebira over, the pouch is conveniently at your hip. If you are backpacking, the detachable pouch has a strap that will fit around one of your shoulder straps, making it about the smallest, lightest "chest pack" there is. Although I don't use trekking poles to hike in to the streams I fish, and I don't need both hands free for climbing, I think this is a slick design. I hadn't spoken to Thom Darrah, the designer and driving force behind TrailLite Designs, until after the design was finalized and the Ebira was already in production, but it could have designed it with me in mind. At that time, I didn't wear a fishing vest, and although my hippers gave me free access to my trouser pockets, the pockets did get a little full with fly box, tippet, cell phone (for emergencies), lines, line holder, etc. Having all the fishing "stuff" in a convenient pouch, right at your hip, is a wonderful idea. It also saves digging into your pocket and possibly dropping something that comes out by accident when you retrieve something you want. That has happened to me at least twice. Once was a very difficult to replace tip plug for a borrowed rod and the other was an electronic card "key" required to unlock the doors of a rental car. The tip plug was never found. The key card was miraculously found relatively quickly but it could have fallen out in any of a dozen places were I stopped to change lines, tippet or flies. Had I dropped it anywhere but where I actually did, I probably never would have found it. Having a convenient place for the small fishing items you must access regularly keeps your other items safely tucked away. The Ebira will hold the minimalist fly box that TenkaraBum flies are mailed in, along with nippers, a small tenkara line holder, a few Hi-Vis fluorocarbon lines, a Tip Grip, forceps and and a couple spools of tippet. What else could you need? The gear fits but is not included. If your wading staff doubles as a trekking pole, and you're wearing your hippers and boots, about the only thing on my accessories list that would pose a problem is how to carry a net. The beauty of the Ebira is that it gives you a way to easily and conveniently carry a tenkara rod when you don't have or want your backpack. And seriously, if it doesn't fit in the Ebira rod quiver, you don't need it. Upon further reflection, (probably about lunch time on a hot day) I have come to the conclusion that there are things you need that don't fit in the Ebira - lunch and a water bottle. 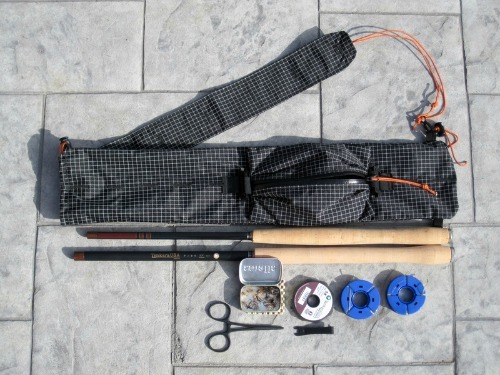 If you have a belt pack, food and drink are taken care of, leaving the Ebira to fulfill its function - carrying your rod and a few lines and flies. All you really need. 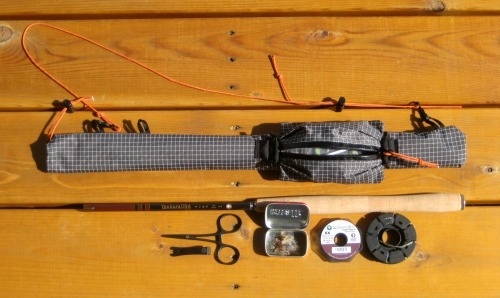 Click for a reader's review of the Ebira rod quiver. The Ebira Plus is essentially a wider Ebira, sewn down the middle to make two separate sleeves so it can easily carry two tenkara rods. Also, the attached gear pouch is significantly larger. Rods and gear not included (and it will hold much more gear than that!). You still don't need to carry much stuff to go tenkara fishing, but with the larger gear pouch, your "not much stuff" is a lot easier to get in and out. 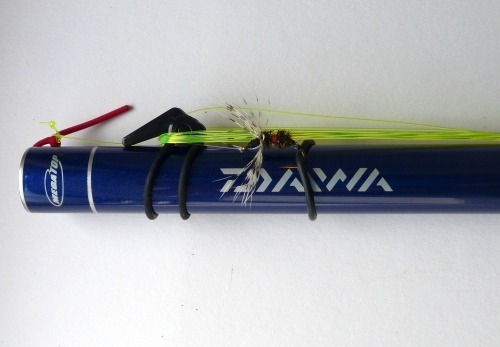 If you think the ideal tenkara rod is actually two rods (for example the Suntech TenkaraBum 36 and the Nissin Pro Spec 320) this is just the the thing you need to carry them, along with a few flies, a few lines, line holders, tippet, nippers, forceps etc., etc., etc. The latest Ebira from TrailLite Designs. The Guide is like the Plus on steriods. It still has two rod sleeves but each one is wide enough to fit two rods (one grip down and the other tip down), giving it the capacity to hold four tenkara rods. It also has two separate gear pouches and a wide shoulder strap rather than just a cord. Designed specifically for guides, who are now beginning to offer guided tenkara fishing trips, and who may need to supply gear for two or more clients, it will also be useful for family trips or fishing trips where you know your buddies are going to want to try tenkara when they see you catching all the fish. And, for people who just can't get by with a couple dozen flies in a Minimalist Box, with two larger gear pouches, plus the ability to put one of them on the shoulder strap for an easily accessible mini chest pack, the Ebira Guide is a very realistic option. The Fuji EZ Keepers and an Ebira are a great combo. Together they allow you to carry a fully rigged rod (or rods) ready to go in seconds. You can rig EZ keepers so that you wind the line on when they are in the up position. Flip them down to release the line. 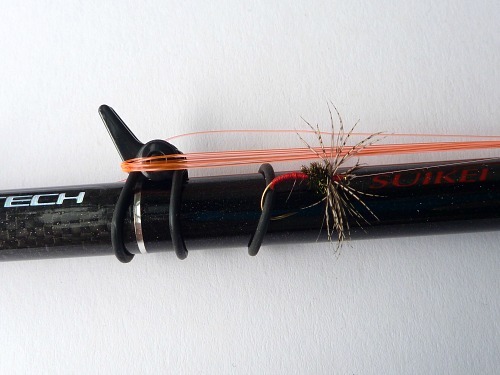 Alternatively, you can rig them so that you wind the line when they are in the down position. Flip them into the up position to release the line. This method is a bit more secure, especially when using the Ebira quivers. They are unlikely to will flip up by accident, releasing the line when you don't want them to.